Director – Terry Gilliam, Screenplay – Ehren Kruger, Producers – Daniel Bobker & Charles Roven, Photography – Newton Thomas Sigel, Music – Dario Marianelli, Visual Effects – Cinesite, Peerless Camera Company (Supervisor – Kent Houston), Pixel Liberation Front, Special Effects Supervisors – Mike Kelt & Simon Tayler, Prosthetic Makeup Supervisor – Karl Derrick, Animatronics & Creature Effects Supervisor – Chris Clark, Production Design – Guy Hendrix Dyas. Production Company – Dimension Films/Mosaic Media Group/Summit Entertainment/The Weinstein Company/Reforma Films. It is the early 19th Century. The two brothers Wilhelm and Jacob Grimm travel throughout French-occupied Germany offering to drive out ghosts and evil spirits that haunt towns in return for a healthy fee. What the villagers do not know is that the Grimm brothers are conducting a scam whereby their assistants use special effects to fake the hauntings. After being sprung by the authorities, the French governor Delatombe forces the brothers to travel to the village of Marberg and investigate several reports of missing children. In Marberg, the Grimms discover that a tower at the centre of the forest contains a genuine force of the supernatural. Gradually, they realise that this is the resting place of a queen who barricaded herself in the tower to escape the plague. She now seeks to return from death, something that requires her werewolf woodsman to sacrifice the blood of thirteen children at the coming eclipse. Terry Gilliam is one of the most unique and individualistic filmmakers working within the fantasy genre today. Gilliam was one of the core members of the Monty python troupe and contributed the surrealistic cutout animations that everyone remembers about the tv series Monty Python’s Flying Circus (1969-74). He co-directed the Python feature Monty Python and the Holy Grail (1975) and co-wrote/appeared in the other two Python films Monty Python’s The Life of Brain (1979) and Monty Python’s The Meaning of Life (1983). In between these, Gilliam’s solo career as a director began to take off with films like Jabberwocky (1977), Time Bandits (1981) and in particular the critically acclaimed Brazil (1985). Gilliam went onto other films such as The Adventures of Baron Munchausen (1989), The Fisher King (1991), Twelve Monkeys (1995), Fear and Loathing in Las Vegas (1998), Tideland (2005), The Imaginarium of Doctor Parnassus (2009), The Zero Theorem (2013) and The Man Who Killed Don Quixote (2018). Throughout these comes Gilliam’s fired-up imagination and bursts of wildly hallucinatory surrealism. As much as this, Terry Gilliam’s films are plagued by production problems and frequent near-financial collapse – there is an entire documentary Lost in La Mancha (2002) that charts the spectacular collapse of one Gilliam film. With The Brothers Grimm, Terry Gilliam supposedly sets out to tell a biopic about the German brothers Jacob (1785-1863) and Wilhelm Grimm (1786-1859). Although rather than an historical biopic, it is best that The Brothers Grimm be regarded akin to a work like Agatha (1979), Time After Time (1979), Hammett (1983), Kafka (1991), Bram Stoker’s Dracula’s Guest (2008), The Raven (2012), In the Heart of the Sea (2015) or the tv series’ The Secret Adventures of Jules Verne (2000) and Murder Rooms (2000-1), which all place real-life authors – respectively Agatha Christie, H.G. Wells, Dashiell Hammett, Franz Kafka, Edgar Allan Poe, Jules Verne and Arthur Conan Doyle – into simulations of the stories they told and suggest that it was these ‘real-life’ adventures that inspired the authors to come up with their fictional creations. In considering The Brothers Grimm, it is best that one throw any knowledge of the historical Brothers Grimm out the window. Rather than adventurers or charlatans, the Brothers Grimm were academic scholars specialising in linguistics who wrote down a series of folktales they had gathered. These were first published as Children’s and Household Tales (1812), which the Grimms revised and substantially expanded six times throughout their lives. The Brothers Grimm were responsible for the telling of a number of classic tales including Ashenputtel (or Cinderella), The Elves and the Shoemaker, The Frog Prince, Hansel and Gretel, Little Red Riding Hood, Rapunzel, Rumpelstiltskin and Tom Thumb. The Grimms’ lives had previously put on film before in the equally fictionalised The Wonderful World of the Brothers Grimm (1962). Up on screen, The Brothers Grimm suggests something of the world of Tim Burton’s Sleepy Hollow (1999) – not to mention that the film also has a hero determining to combat superstition with scientific methodology circa 1800. Although, far more than that, The Brothers Grimm reminds of Peter Jackson’s The Frighteners (1996) about a conman who was conducting an elaborate scam to convince people they were being haunted so that he could collect an exorcism fee who was then suddenly forced to confront the supernatural for real. As always, there is the constant theme of flawed heroes that runs throughout Terry Gilliam’s films – where characters have the burden of classic heroism thrust upon them and either prove to be rent by self-doubt, self-loathing or, as here, are charlatans who are forced to accept the burden of what they claim as real. The Brothers Grimm was subject to a creative struggle between Terry Gilliam and The Weinstein Company. 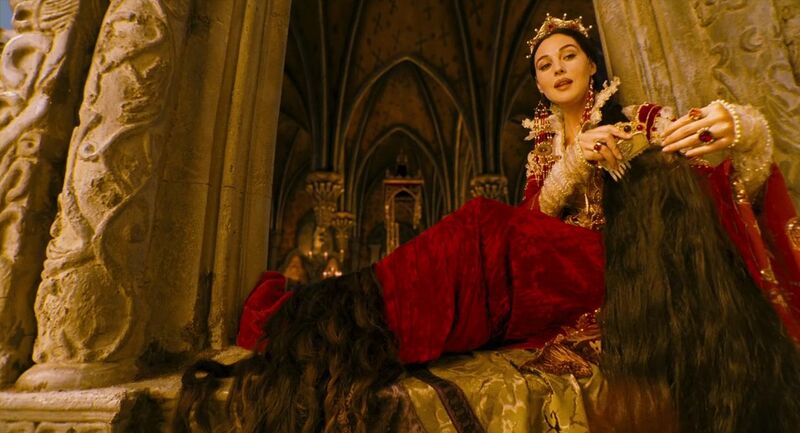 The Weinsteins picked The Brothers Grimm up in 2004 after Gilliam’s financing deal with MGM fell through, but thereafter proceeded to interfere with the project, including insisting on casting choices and the firing of original cinematographer Nicola Pecorini. After shooting wrapped, arguments went on for over a year between Gilliam and the Weinsteins over the final cut of the film. When The Brothers Grimm was finally released, Terry Gilliam accused the Weinstein brothers of doing everything they could to sabotage the project. As such, The Brothers Grimm feels like it is torn creatively – on one hand between Gilliam’s desire to open up into his customary fantastical set-pieces and on the other the Weinsteins’ desire to push the film into a traditional narrative to make it more of a commercial sell as a fantasy adventure. As a result, The Brothers Grimm emerges as one of the most disappointing films in Terry Gilliam’s otherwise excellent oeuvre. Gilliam seems to conceive his films the way an artist does in terms of scenes and images (rather than as a writer does in terms of narrative) – be they a giant rising up out of the ocean with a ship as a hat, Baron Munchausen dancing up into the air with the goddess Venus or giant Mediaeval monsters rampaging through the streets of New York City. Most of Gilliam’s films feel like they are conceived as individual set-pieces of wild flights of fantasy that are often struggling to confine themselves within a plot. However, The Brothers Grimm ends up being a cramped and dour film that never opens up with any Gilliam-esque flights of fantasy. While the sets are often lush, the film’s effects are more mediocre than they have been in any other Gilliam film. In particular, the werewolf-to-man transformation looks like it is only a big CGI effect. The Brothers Grimm also shows up some of Terry Gilliam’s less positive aspects such as a tendency towards cartoonishly exaggerated characters – the villainous characters played by Jonathan Pryce and Peter Stormare become shrill and one-dimensional buffoonish caricatures. There are times that the film descends into noisy slapstick chaos. Nor does what would otherwise be the star duo casting of Matt Damon and Heath Ledger rise to anything of note. Matt Damon remains characteristically gloopy and subdued throughout – he never seems to get into the spirit of the film either in terms of rising to heroism or the wacky sensibilities that Gilliam operates on. Heath Ledger, who at the time was just starting to prove himself as a serious actor rather than a pin-up boy, proves not too bad with his performance of sly introversion. 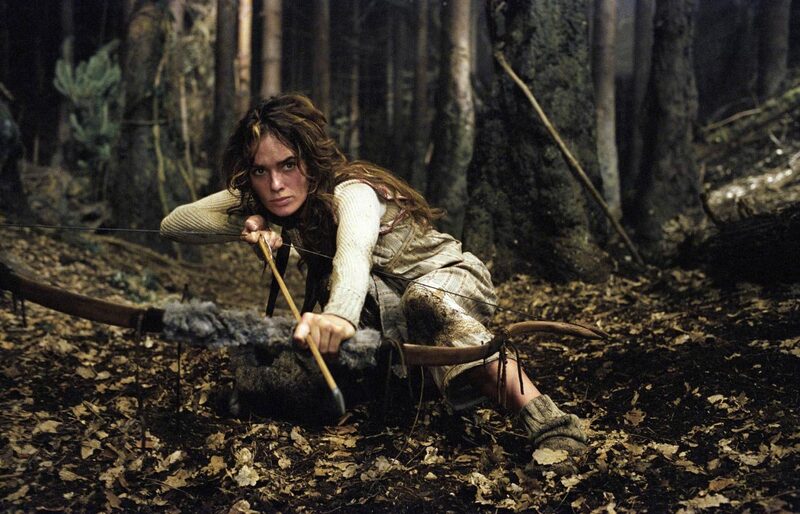 The strongest performance in fact comes from the underrated Lena Headey as the local girl who guides them into the forest, although one wishes there had been more of her in the latter half of the film. Peculiarly, Ehren Kruger’s script throws in numerous reference to various fairytales – be they Grimm tales or not. There is a Little Red Riding Cape (the Grimm’s original name for Red Riding Hood) venturing into the forest pursued by something; a Hansel and Gretel that likewise go missing; a tar creature that emerges from a well and runs through the town before shape-shifting into a Gingerbread Man; a witch who lives inside a mirror and needs to be revived from a death-like sleep; glass slippers; a scene where the Brothers fall onto a heap of mattresses, creating suggestion of The Princess and the Pea; a woman imprisoned alone in a tower in the forest a la Rapunzel; talk of how the Brothers traded a cow for magic beans. The idea seems to have been to suggest that these events inspired the Brothers Grimm to create their tales but the effect is haphazard and often contrived – the Gingerbread Man sequence, for instance, occurs at random and has nothing to do with the main story. 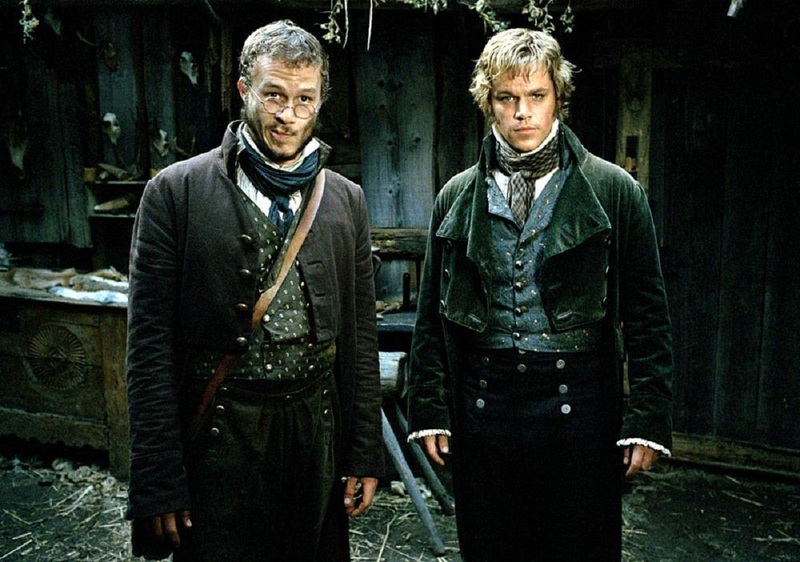 In 2015, plans have been announced for the development of a The Brothers Grimm tv series. Screenwriter Ehren Kruger received a reputation with non-genre works like Arlington Road (1999) and Reindeer Games (2000). Since then Kruger has begun to specialise in genre scripts with the likes of New World Disorder (1999), Scream 3 (2000), Impostor (2002), The Ring (2002), The Ring Two (2005), The Skeleton Key (2005), Blood and Chocolate (2007), Transformers: Revenge of the Fallen (2009), Transformers: Dark of the Moon (2011), Tin Man (tv movie, 2014), Transformers: Age of Extinction (2014), Ghost in the Shell (2017) and Dumbo (2019), as well as produced Dream House (2011).